1. Sketch out your contour map. I told the children that we had enough card for each pair to guarantee 5 layers but as they are building, they can swap their left-over card with others to enable them to use different colours for added smaller layers on top. 2. Cut out your sketch. 3. Use your cut-out sketch as a stencil to cut out the same shape in coloured card. 4. Cut the first layer out around your sketch to leave you with your next layer. 5. Use this new stencil to cut out the shape from a different coloured piece of card. 6. Keep repeating this process until you have cut out all of your layers from card. 7. Cut strips of card and bend them into a 'Z' shape. Glue 3-4 of these between each layer to raise it up and make it 3D. I love all of the bright colours and creative designs. Some groups really went all out to create very interesting, complex shapes. Excellent job, Year 4, especially considering that these were completed in around an hour and a bit. Next post will be a project that's been done by every art teacher blogger, but I just had to give it a go myself! We're into the second week of our Easter holiday and thoughts are now turning anxiously towards the continuation of school. 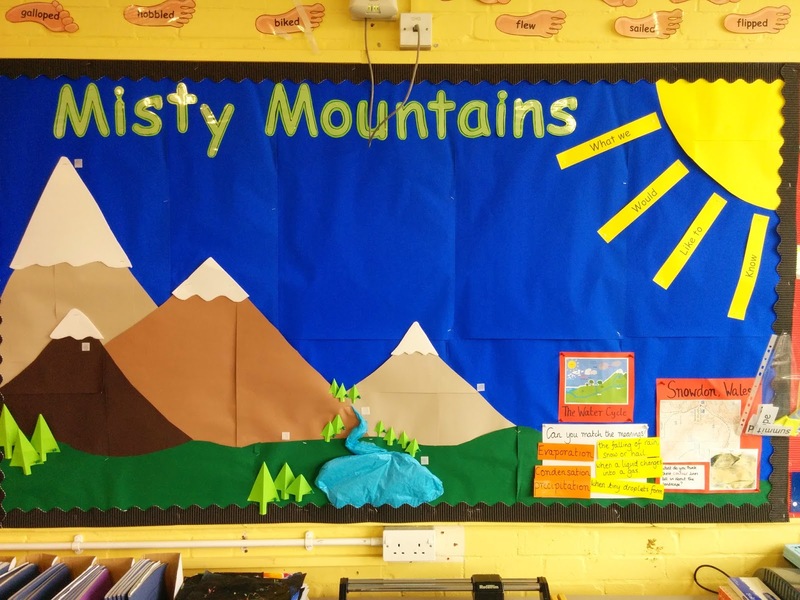 Our next topic is entitled Misty Mountains and my LSA (Mrs Webb) kindly volunteered to come into school over the holiday and rustle up a topic learning wall. There have been some clues about Mrs Webb's hidden artistic abilities but this definitely blew me away when I first saw it. She's made it interactive so that the children can match up definitions. There's also space to display other artwork we do over the next few weeks and space for post-its where children can write down things that they'd like to find out about. Well done and thank you so much! The children will be so excited when they see it on Monday.